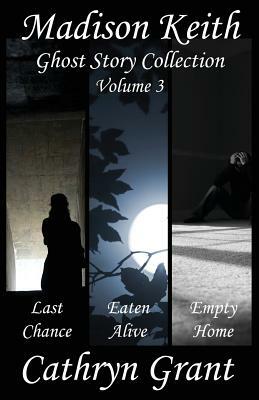 This collection includes novellas seven through nine in the Madison Keith Suburban Noir Ghost Story series: Last Chance, Eaten Alive, Empty Home. Even though she doesn't believe in them, Pastor Kate believes she's been assaulted by a ghost in the novella, Last Chance. She asks Madison to spend a few nights at the home where she's helping one of the church deacons and his wife with their new baby. Not only does Madison encounter a ghost who is bloody with pain, she alienates her hosts with her constant questions about the history of the quirky, moldy house. When Madison encounters the ghost herself, none of her questions are answered. When she pushes harder to find out the identity of the angry spirit, JD tells her she doesn't need to investigate, not all ghosts are her responsibility. Madison is determined to get an answer. Will she also find the courage to look for answers to murders in her own past? In the eighth novella, Madison feels she's being "eaten alive" with thoughts about her past, but when she asks Pastor Joe for time off to look for closure, he questions her commitment to her job. When she discovers her murdered neighbor's body, she resorts to minor crimes herself to find out more about his life. An ugly ghost with cryptic messages and an uncertain identity drives her curiosity to the point of obsession. In the ninth ghost story in this series, Madison is determined to get some answers about the ghosts from her past. Returning to her childhood home, she finds more than she bargained for: a detective who no longer cares, an aunt and uncle who are not the people she thought they were, and a ghost from a different murder altogether. Her desire to find out the truth pushes her close to the edge. Both the living and the dead like to reveal their secrets to Madison. As the administrative assistant in the basement office of a suburban church, she gets plenty of opportunity to hear from both. Through it all, Madison continues to offer up a steady stream of opinions on everything from the subject of religion and ghosts to finding a soul mate.